Greetings from the North Country! I began my position in January 2018 and am so excited to serve as the Medical Librarian here at Champlain Valley Physicians Hospital. Prior to coming to CVPH, I was the library director and systems/technical services librarian at Clinton Community College, also in Plattsburgh. My family relocated here from outside the Buffalo, NY area in August 2010 for my position with the college, and we love all the region has to offer. There’s a library in the hospital? So many folks, myself included, didn’t know our hospital had a library. A thorough search of the institution’s website to prepare for an interview didn’t reveal evidence of this either. Looking back on my invitation to interview, the presentation I was asked to make for the committee was, “What do I envision a 21st century community health library to look like?” After researching the organization and not finding the library, I prepared my presentation and built an accompanying website for the library, as one did not exist. Fortunately, I was offered the position, and upon starting here, I used my presentation as the blueprint to guide the redesign of our physical space, create an effective and attractive online presence, and assess and improve services and collections to meet what I feel is the most important quality of a 21st century community health library – ACCESS. I grew up in my local public library and worked my way through college in libraries. The library was and always will be a familiar and comfortable place for me. As an undergraduate, I pursued degrees in medical assisting, liberal arts, and health and wellness promotion, where I studied anatomy and physiology, medical terminology, community needs assessment, and related coursework. I feel I bring a solid understanding of the health sciences to our library environment. In addition, my education led me through more than a decade of work experiences providing hands-on patient care as an EMT and medical assistant, serving as a community health consultant for a NYSDOH diabetes grant, and then as a home-based medical transcriptionist, when I began raising my children. 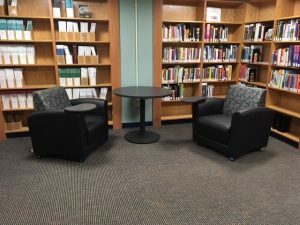 After the birth of my second child, I decided to return to school for my masters, and there was no doubt I would pursue my library science degree. My love for the library coupled with my passion for the health sciences would certainly support my desire to find work as a medical librarian. Today I know that I am very fortunate to be able to put all of these wonderful experiences to good use by working in the CVPH Medical Library. I feel confident in my ability to speak the language of library patrons – physicians and physician extenders, nurses and nursing students, family medicine residents, hospital administrators and our surrounding community of patients and their families. I feel like I make a difference – I provide access to valuable resources that improve patient care and help us to achieve our key results. Working with colleagues and a great team of volunteers, I’m pleased to share the library now has its first OPAC through LibraryCat, with over 300 cataloged items. The OPAC can easily be accessed on the library’s first public-facing website, where patrons can also gain access to our collections of electronic resources and a variety of services such as literature searches, document delivery, table of contents notification, and more. Remote access for staff is forthcoming, as we are working to institute EZProxy. 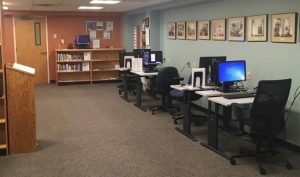 With generous support from the hospital’s Foundation, we’ve been able to update our physical space with new paint, a variety of furniture and a web-conferencing PC. I love hearing the surprise and positive feedback from staff who haven’t been to the library in a while. The majority of my day is dedicated to searching for evidence-based resources to support direct patient care. The hospital has is a Magnet facility, with a recently accredited Nurse Residency program, family medicine residents and nursing students from three local colleges who complete clinical rotations in our facility. The library supports all those programs. PubMed, My NCBI, DOCLINE, ClinicalTrials.gov and MedlinePlus are integral key resources and services for our organization. Without them, we would not have the access we need to deliver the care in our library. 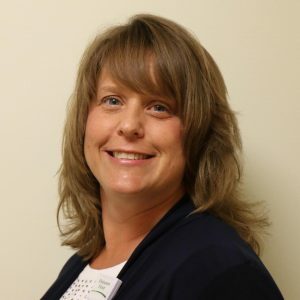 In August 2018, I was asked to serve as the embedded librarian for a new grant-funded initiative following the UNM Project ECHO model, to enhance the capacity of the primary care workforce throughout the North Country in delivering care to patients with Hepatitis C. Working with the ECHO team, I built a website for the area healthcare providers which contains all of the resources shared during the ECHO sessions – information regarding medications, treatment guidelines, diagnostic algorithms, pre-treatment worksheets, and diagnostic ordering guidance. The project, led by a local infectious disease specialist, has been quite successful, as it allows patients with complex health conditions to seek more timely treatment in their own communities and reduce unnecessary referrals to specialists. Working as a medical librarian at Champlain Valley Physicians Hospital has been a dream come true. Having access to NLM resources and support from the wonderful folks at NNLM MAR has made it possible for me to easily support the needs of the providers to ensure we are taking care of our patients and meeting the diverse needs of our rural community. Written by Jill Tarabula, Medical Librarian at Champlain Valley Physicians Hospital in Plattsburgh, NY, for the Winter 2019 edition of The MAReport quarterly newsletter.